SharePoint Online from Scratch was published as e-book and paperback at the beginning of 2016, but we have already released an update. 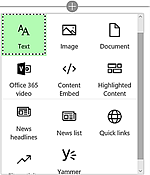 The new version includes SharePoint Online enhancements like the new library experience and the new page model. In the update process I also re-wrote the first chapter about getting started with Office 365 and made other enhancements to the book. Microsoft has a lot of SharePoint instructions online, but they have no real course or manual with a progression. You have to know what you are looking for to use the Microsoft tutorials, and how can you search for something when you don't even know that it exists? Not even Microsoft has given much information about the new customizable SharePoint Online page model, which is now an alternative to wiki pages and web part pages. I hope my book will fill a gap, because in the updated version I go through the different possibilities and explain how each new page model web part can be used. The new library interface may be used instead of the classic experience interface, and as it is easier for users and give some new possibilities I think it will soon be the most popular option. But today some customizations can only be made with the classic experience, so through the whole book I have commented on and showed both the new and the classic library interface. I must admit I had hoped that my SharePoint Online book would be up to date a bit longer, but at the same time I appreciate the enhancements Microsoft has rolled out during the year. For many users the new interfaces for pages and libraries are easier to understand and customize than the classic design. But SharePoint power users complain that the new interfaces give less possibilities – and authors complain that their books become old too early! The new version of SharePoint Online from Scratch is released on Amazon.com, and very soon both e-book and paperback will be available on all Amazon sites. It feels very satisfying to know that my books are popular and readers find them helpful. My first book, Excel 2016 from Scratch, is still up to date, because I created it from the preview version and Microsoft has not made important changes. 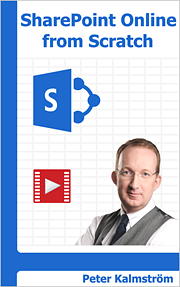 Therefore I have already begun drafting two more books, about SharePoint Online and Office 365!